Discussion in 'Downhill & Freeride' started by dante, Nov 11, 2005.
so anybody who's been waiting to run a DHX on their sunday, contact your local shop (or contact us directly here at Iron Horse) and we can get you rolling ASAP. Anyone know the manufacturing process? looks cast instead of machined out of billet? No it doesn't look cast, it looks forged and machined and I think you'll find most higher production links, etc. are done that way. You can easily round the edges and finish of a CNCed part so that it doesn't look CNCed. Damn, more **** I have to buy now. Travis, Todd, or DW. 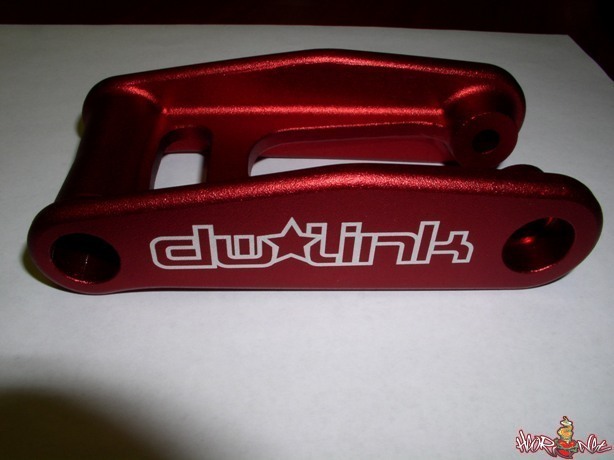 If I pick up a DHX does it have to have a special tune or are they being used stock? Also I am 160lbs plus gear and run a 275lb spring on the 5th. What spring rate would I need on the DHX? It looks bead blasted to relieve stress. 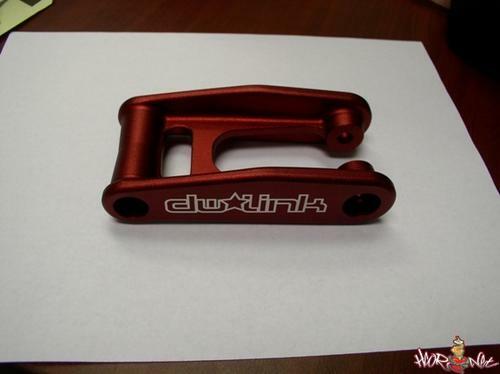 The link is made from forged 7075 T6, post machined and bead blasted, then anodized and laser etched. I'd say that's a freekin bargin at $100. nice work. Just tell Fox you need the "Iron Horse Sunday" tune and they should know exactly how to build it. You will need 23x8mm hardware on both ends. If you are liking the 275# on the Progressive the 300# on the Fox will prolly be to your liking. Todd: do you need to run Panaracer, red sidewall tires for these links to work properly? So DHX links are available. How about Sunday factory frames? At 160lbs, I run a #300 spring, 160-180 psi, 0-1/2 PP, full BO... what a beautiful ride. At 80 psi it's a full blown cadillac. Running the DHX allows you to tune in so many different ride characteristics. I dig it.